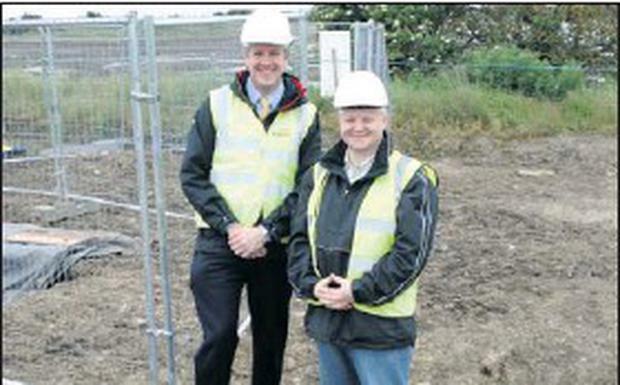 EirGrid's Sean Meagher with Joe Corr at the site of the discovery at Rogerstown Estuary, near Rush. CARBON dating is to be carried out on the bones discovered near Rogerstown Estuary in Rush to determine if the bodies date back as far as Viking or early Christian settlements. EirGrid has moved to reassure concerned locals that the company is carrying out all of its obligations in relation to a potentially important find which was unearthed as it proceeded with its electricity interconnector project. As per the An Bord Pleanála planning condition, there is a full time project archaeologist present during the works on the Interconnector, according to the company. The previously unrecorded burial ground was uncovered following localised subsidence at the edge of the trench when back filling the installed ducting was being finalised. In adherence with the archaeology licence obtained by EirGrid, the project archaeologist immediately notified National Monuments Services and National Museum. At present, only bone fragments have been uncovered. An osteoarchaeologist has assessed the bone fragments and has confirmed that they are human. Former local councillor, Joe Corr recently visited the site to see the evidence for himself and met with EirGrid's Sean Meagher who shared with him, all the available information on the discovery. Mr Corr said: 'Fingal County Council's Heritage Officer has been fully informed of the find and has visited the site.
' The project archaeologist is submitting a method statement to National Monuments service and the National Museum. Once the appropriate licences are in place, Mr Corr said that the bone fragments will be carbon dated to discover if indeed this is an early Christian or Viking site. The discovery, however, is not expected to delay delivery of the Interconnector as works in that area have been completed. Mr Corr concluded: 'I was glad of the opportunity to visit the Rogerstown site. This is a great discovery for the town.